We have seen it all during that period and have developed a range of drum handling equipment that can do most jobs in most environments, from the Arctic Circle to the Arabian Gulf. Recently we were asked by a client to manufacture one of our Grab-O-Matic model DH-1 single drum handlers for use within an ATEX zone. This is a workspace deemed to have a potentially explosive atmosphere. The DH-1 is suitable for steel drums only with pronounced rolling rims. The drums are automatically grabbed around the waist and released when set onto a surface and the truck reversed away. Our range of fork attachment drum handling equipment is usually made from high quality British steel, with frames and pillars made from 6-12mm steel to ISO 9001:2015 standard and issued with test certificates to guarantee safe operation. Grab-O-Matic drum handling attachments are robust, manufactured entirely in the UK by precision engineers, and we carry out a 100% inspection of all products before they leave the factory. However, in this case we had to use stainless steel in the manufacture of the DH-1 because it was going to be used in either ATEX spark proof areas, clean rooms, or both. Stainless steel eliminates the possibility of sparking when the drum grab hits the steel drum. 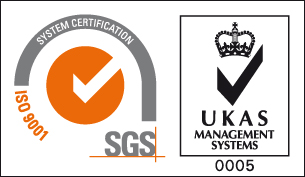 It can be certified for use in ATEX Zones including 0, 1 or 2 and also gas and dust zones. 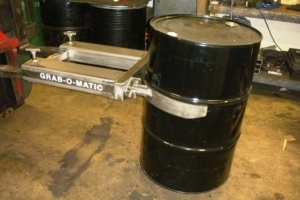 The majority of the Grab-O-Matic drum handler range can also be manufactured from stainless steel for use in ATEX areas including the 1 and 2-DLR Rim Grippers, SC10 Drum Rotator and 1-DLR-BG Base Gripper. St Clare Engineering Ltd is a family business, manufacturing a range of high-quality fork lift truck drum handling attachments at our factory in Eastleigh, Hampshire since 1959.